This story was from a couple years ago. Was hunting for whitetail during the peak of the rut. It had snowed during the night. The area I was hunting in is fairly quite as far as traffic and pressure. No recent or new cut blocks no current oil and gas activity. No well travelled roads. Just me and the animals..... just the way I like it. I was traveling a seismic line looking for hot tracks in the fresh snow. The conditions were really good for tracking. The first set of tracks I came across that day were accompanied with blood, and lots of it. I of course followed. 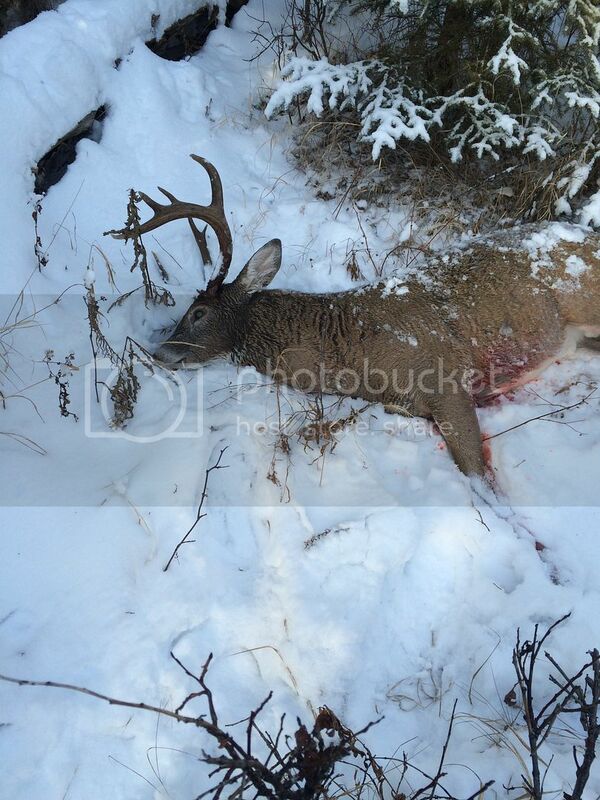 With in less than 50m I find a nice 3.5 to 4.5 yr old buck dead. He is still warm, he doenst even have rigger mortis yet. He has a hole right in his chest(low )behind the front leg, just like he has been shot. I am really wondering how this Buck could have been shot the day before and bled that much and still made it through the night. Like I said. There is no one else around and I am in a fairly remote quiet area. It also has only one way in. I take a few photos and decide to back track the buck to see where he came from. I travel only 50 m back into a thick mature spruce with blow down and find out what happened. The tracks showed two bucks coming together, ( and a doe close by) they have a very quick fight and the looser get pushed up against a log and then splits. He is bleeding almost immediately, he jumps a log and runs off. I check the log for sharp broken branches cause those can impale also but there is no sign of it. 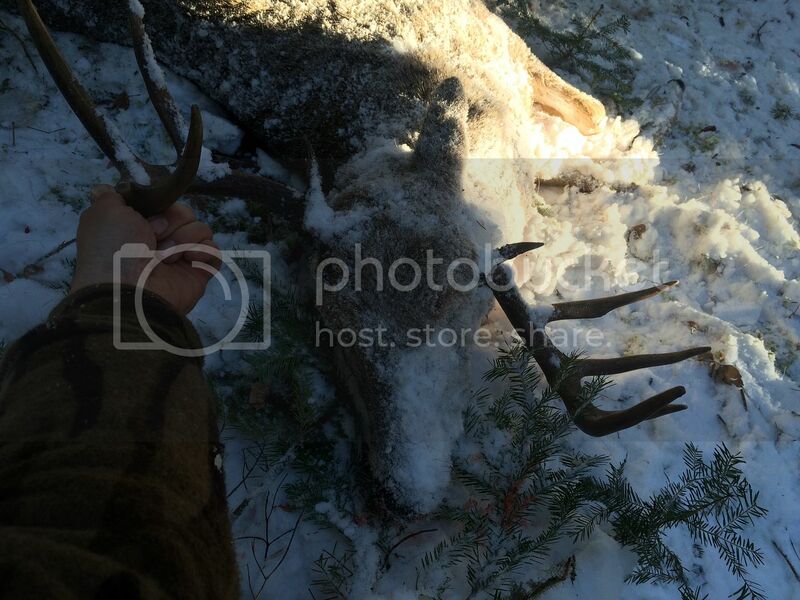 That buck died from an antler getting stabbed right into its chest. Right in the heart as far as I could tell from the blood, spray, colour, lack of bubbles. 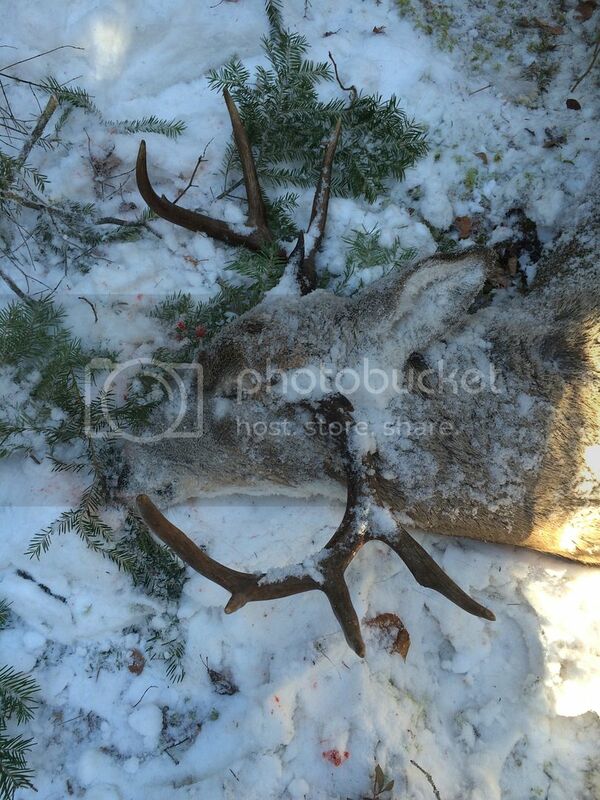 I am torn because there is perfectly good meat there but that means my hunting season is over if I tag this buck. I elect to leave him. Nothing in nature is wasted. I continue on hunting. Plenty of day left. I go another 700 m and I see and hear ravens. I listen for a bit and see a coyote headed that way. There is no rest available to get steady and he is 400 m away but I send one his way anyway. Its his lucky day, I missed. I head toward the ravens to satify my curiousity. I aprroach gun ready and with caution cause there could be a predator on whatever has attracted these ravens. I find the area clear of danger and head in to find another dead buck... same age or so. This bucks antlers are messed up, one side points down. I lift his head up and his skull plate is broken at the pedistal. He has been dead for a day or two The ravens have him opened up. Its possible that someone wounded this buck and he got away only to die later but I can’t really see any damage to hide by his head. I think it might have happened in a fight and he fractured his skull and died. I really should have followed the buck killers tracks from the first part of the day but it was a blow down hell and I just didnt think of it at the time. Wonder how BIG he was!!! Last edited by husky7mm; 02-10-2019 at 04:56 PM. That is a pretty crazy scene to come upon,good on you for following up to figure out what happened. The things that happen in nature are amazing! Neat that you were able to follow up until you found the carcasses! Great story and pics to follow along! that first one was a fine buck to take out even though you didn't shoot it. did you ever get a buck and if so was it better than the one you passed on? I did not shoot a buck that yr. I had taken a nice bull moose in early oct. I have not seen a buck that I have been excited about for about 6 yrs but the trail cams say they are around. The area is a low density deer area full of wolves and cougars but people don’t go there often so that is the draw for me. In my opinion loosing two up and comers from that area is a huge lose. The first buck didnt have great potential to be a nice typical but I have a few bigger none typicals that started off as typical so you never know what to expect really. That's a really cool story and pics! Well if ya put a moose in the freezer than I see your point on holdin out. Your sitting pretty good as far as i'm concerned, moose is way better than deer. If you wouldn't have pieced it together with the tracks and snow, you could have easily come to the conclusion that these were shot and left and or wounded. Sometimes there is no one to blame for wasted animals or carcasses. $10 for a “found dead” permit and you don’t have to burn a tag on it. Didnt realize that it would include the whole carcass, good to know.